Marketing, Advertising, & Branding... What's the Difference? In this line of work, I oftentimes hear clients and prospective clients confuse marketing, advertising, and branding, and they also tend to use the terms interchangeably. This usually makes me cringe just a little bit, because, while all three of these things may be a part of the bigger-picture plan, using them interchangeably like this grossly oversimplifies the deeper meaning and more complex concepts behind an effective marketing strategy. To understand marketing and the difference between these three concepts, it helps to look at yourself and try to apply each one to you as a person. Marketing can be though of as how you see yourself. It is the image that you are trying to present to others around you. In this analogy, things like how you dress, how you groom, and the colors and patterns you chose to wear all play a part. We all have a strategy for this (even if we don’t consciously realize it). Even not having a so-called strategy for your appearance is a marketing strategy in itself. You choose your image to portray yourself as a business professional, a punk rocker, a tech nerd, etc., and by doing so, you are expressing to others your character, attributes, and in the end, the value you offer to others, all through your appearance. For a business, a marketing strategy considers how you want others to perceive your company. It should convey the vision and of the business and express it in a way that the public will recognize and begin to associate with your company. How you “dress” (or market) your company will determine how effectively your message and image will be accepted by consumers you want to reach. Advertising is how you act in public. 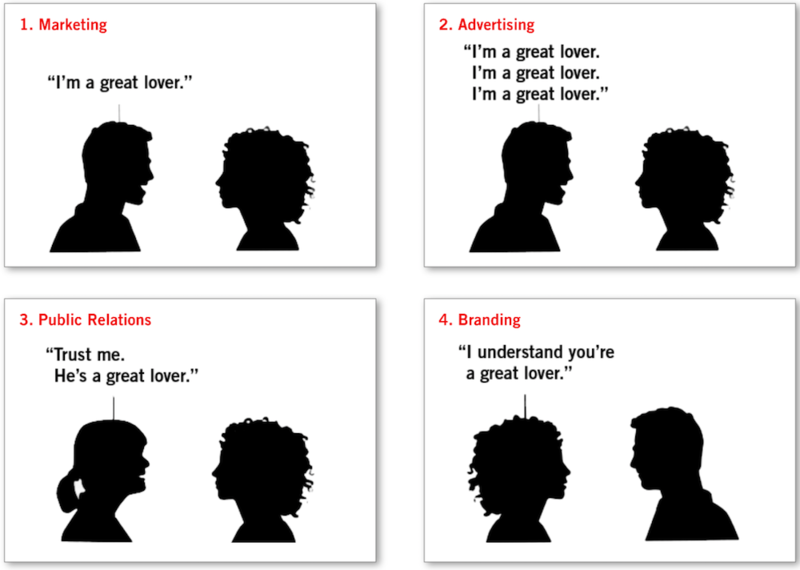 While marketing describes how you see yourself, advertising describes how you act around others. Where you hang out, who you hang out with, how you carry yourself, and what you say are just as important as how you look. All of this should be considered with your marketing strategy to assure that you have consistency between your image and your actions (remember: actions speak louder than words)! Branding is how others see you, and, the good news is you can help influence this through marketing (how you see yourself) and advertising (how you act in public). If you have a strong brand, you can spend more time building on it. If you have reputation problems, however, you will need to focus on rebuilding or changing other’s perceptions of you. For example, if your professional network believes you are a ‘fraud’ or a ‘slacker’, then it will require more than just dressing professionally and mastering your LinkedIn profile to change this perception. You’ll need to re-work and re-stratgise your personal marketing and advertising. When it comes to business, understanding how your audience and consumers perceive your business is critical for how you decide to execute a marketing and advertising strategy. This is why the branding component of this equations is so important. While I just oversimplified complex marketing concepts quite a bit, I find that applying these concepts as an analogy to ourselves creates an effective and simple way to explain how each of these three concepts can and should be applied to your business.